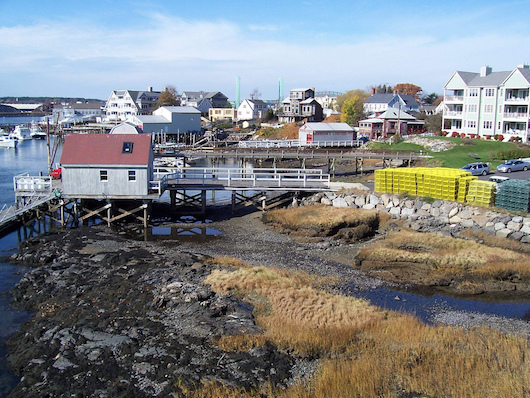 There’s more to Kittery than outlet stores! Here’s an opportunity to explore a part of Kittery beyond the bridges and tangle of Rt. 95 and US1. We’ve put together a route map that mainly follows Rt. 103 north toward York. This is the best spot in the area for water views. We start at the Kittery Point Yacht Yard, and run along Rt. 103, along Kittery Point. After 0.6 miles, it reaches the Fort McClary State Historic Site. Take quick jaunts down to Phillips Island and Hoyts Island. At the 2.5 mile mark, BEAR RIGHT on Chauncy Creek Rd. where it splits with Rt. 103, and follow along Chauncy Creek for about 1 mile. A good turnaround point is at Rachel Carson Nature Preserve, or you can do the ~1 mile Cutts Island Trail. Note: On some sections there is no sidewalk or shoulder, so caution is advised.